On top of a mountain overlooking the coast from Palos Verdes to Malibu lives one of our creative treasures, architect Eric Lloyd Wright, son of Lloyd Wright, grandson of Frank Lloyd Wright. It is an idyllic setting. There are coastal live oaks and valley oaks all around, a pond surrounded by sycamores, an orchard with citrus, plums, avocados, peaches and apricots. And, of course, an organic vegetable garden. Huge boulders spot the grounds like perfect accents. We talked in his offices which consist of two trailers connected by a deck and a roof. It’s solid and simple with a patio built around two sides. We’re sitting in a dining area inside while Mary, his wife, is cooking in the kitchen which is actually one of the trailers —also inside. We are outside the trailer, but inside the structure. It’s an interesting situation, one that makes more sense after talking with this lively and engaging man of seventy-seven years. His grandfather had a full blown working career well into his later years and talking with Eric, I sense the same heartiness—his curiosity, vitality and total immersion in life characterize a creative life going strong. D: What are your inspirations right now? E: Nature. What goes on around me in nature, that’s my biggest inspiration. D: How do you keep in touch? E: One of the reasons I moved up here and work the way I do, having my office and my home on my site is that I get to be in tune with it all the time here. D: Has that been consistent from your first days working, that nature was an inspiration? E: Yes. That’s always been the basis of the architecture that I’ve worked with through my father and my grandfather. My grandfather took the word organic architecture. He called it organic architecture and that was working with nature, looking at nature, studying it. And, of course, it takes in more than just what we think of as nature. When you do a house, you take in the nature of the person which you’re building the house for— their nature, how they want to live, how they want to use the house. D: Can you give me an example? E: My brother’s house was the first house that I designed and had built. His companion was a very well known writer, Anaïs Nin. They lived together. They didn’t have any children but they loved to entertain. They had four or five parties a week, soirées. D: This is the 50’s? 60’s? E: This is the 50’s and 60’s. The house was started in 1960. They didn’t have a lot of money. The original house was around 1200 sq. ft. and most of it we put into the living room. We made it so that there was just one bedroom and a little study for Anaïs, a bathroom and living room. The dining area was part of the living room and it wrapped around into a kitchen behind the fireplace. So it was all one big flowing space. Instead of a wall between the master bedroom and the living room we put a folding partition which you could open so that the master bedroom was part of the living room and you could entertain in that whole space. Well, that’s taking into account the needs of the client, how they want to live. The dining room, living room and master bedroom could be opened up into one large space. But I told them that if you make the master bedroom part of the living room you have to make your bed. (laughs) You’ve got to keep the room clean. But it worked out very well, and in fact, once we put the partition in they left it open all the time. It just sat there. Actually, the rollers have broken and you can’t close it now. D: What part of town is that in? E: Silverlake, right across from the reservoir near Echo Park. E: That comes from the idea that architecture is a germ idea. It starts with the idea and it grows out from the center. So, in doing my schematic designs, I usually start with a site plan. I look at the whole site and decide where the best situation for the house will be. I block out a very rough floor plan/idea of sitting on the site. And I start with that floor plan and then I work it until it’s in the right situation for that site and it’s fitting in. Then from that I start developing the floor plan so that it includes all the things that we need, the various rooms and functions, taking into consideration where the view is, how the sun is, where the wind comes in–all those elements of the natural site. So that I start really with the floor plan—the “interior space” when I begin to develop the house, after I’ve sited it. Then I’ll cut a couple of sections through there and develop sections. I first create a two-dimensional space in the plan, then I start doing the three-dimensional space with these cross sections of the building because I can see relationships of heights. When I do that I like to get different height levels if possible to make an interest in the flow of space. Once I get the sections where I like them and they’re working with the plan, then I do the elevations, then I do the final exterior. So the exterior has been shaped by what’s going on inside the building. That’s organic architecture. When you finally end up with the exterior shell it’s an expression of what’s inside—just like a seashell. It allows you also to have any number of forms because that’s the way seashells and other forms are. D: Have you seen the properties of organic architecture filter down into middle class houses? E: Oh, yeah. I think that one of the big influences that organic architecture had was on the ranch house which you’ll find in a lot of subdivisions today. It was much more prevalent in the 50’s, 60’s and 70’s, but it had an open floor plan. You go into a lot of these tract homes and they’ll have an open plan. They’ll have a living room with a dining area offset from it and a kitchen around the wall with no doors. That openness came out of organic architecture. The Victorian was all boxes. You had your own separate dining room, living room, little entry box and so on. You went from box to box to box. Here, this opened it up. It made a flow plan. And that was all based on the interior space. And then, of course, there’s the concept of working that interior space to be in conjunction with the outer space. So that you didn’t feel a separation, that there was a continuous movement from inside to outside. A lot of that is accomplished with, of course, glass, opening it up. For instance, on my front entry, I have no corner post, the glass is mitered. When you do that, it opens the room up. Where you have a post, your eye goes right to the post. Without it, your eye takes in the whole panorama around to the next post. So, it opens up the corner, it doesn’t box it in and the space continues to the outside. Another thing is the materials you have inside Say I have concrete block outside—you bring that inside as well, so there’s a continuous flow. You don’t just stop at the door and say, I’ve got plaster here and have stone out there, you wrap that around. D: What do you see as the obstacles to organic architecture becoming more a part of our daily experience? E: A couple things. It’s not new, it’s very old, but people are used to certain styles and forms of architecture. They like the Tudor and the French and so on and go for the style rather than the substance of the thing. It’s a lot easier to teach certain forms of architecture in the universities. Organic architecture is rather hard to teach. It’s very complex. And there are very many different ways of tackling it. It’s basically set up like a fractal system in nature. Nature works on many small parts making up the whole and each part is related to the whole. Well, in our stock housing and so forth, it’s easier to make boxes and put them together than it is to make these more complex forms that you see in nature. Synthesizing those forms of nature for human development take more work. D: Do you get excited about new materials that you see or read about? E: I get excited about them all. I think they all have possibilities if they’re used for their nature. I don’t like it when they take plastic and make it look like wood. You can get plastic shingles they make look like wood. Well, if they have it like plastic then that might be interesting, but to imitate a wood shingle, that’s something else. I look forward to new materials. One of the problems is you look at something and think this is a great idea, I could use this special block for walls…for instance, cement that has insulation mixed together to make a light-weight block…these things are all interesting, but it turns out that they become expensive because the contractors are not used to working with those materials. They like their old 2×4’s, they’re used to that. It makes it difficult when you enter with new materials. I think where you have to go with all of this is that there’s just going have to be manufactured housing. E: Yes. That’s like factory built. D: A whole prefab house? E: A whole prefab house, yes. For most people. The costs have just gone out the window. D: I see you have a geodesic dome in your yard. What’s that about? E: A friend is trying to convince me to work with him on a project with the domes. I don’t like just the geodesic dome itself. It’s a rather static form because it’s symmetrical all they way around. But if you start combining two or three domes and interlocking them so they aren’t’ just standing separately, but like bubbles, then I think you can do something interesting. So we’re sort of looking at that. D: If someone were to take an architectural tour of Los Angeles what are some sites you’d recommend? E: Well, one would be my father’s building [Lloyd Wright], Wayfarer’s Chapel in Palos Verdes. That’s a very important building. And there four concrete block houses by my grandfather which are very interesting and unique buildings. Probably right now the best one is the Storer House, it’s in the best condition. D: Is that the one that David Lynch lives in? On Franklin? E: No, David Lynch lives in my father’s house, off of Outpost Drive. D: The one on Franklin is my grandfather’s, the Soden residence. That’s a very interesting house. There is a gem of a house of my grandfather’s in Brentwood, the Sturges house. You can’t get inside, but you can see it from the outside. Marvelous little house. There’s the Taggart. There’s his own house on Doheny Dr. That’s important because it was his studio. D: Can one visit that? E: Not easily. These are all private houses. The only one open to the public would be Hollyhock House in Barnsdall Park. There is another FLW building open to the public, but it’s not properly taken care of and they’ve ruined it with signs and things. It’s a commercial building on Rodeo Dr. in Beverly Hills. It used to be called the Ardmore Court. I don’t know what they call it now. It’s quite unique. It’s not a flat front. It’s three-dimensional set back with a little courtyard right off the sidewalk. It’s a three-story building and you go up a hexagonal ramp to service the different levels of stores. It’s quite unique. People have a hard time with it, but I think it’s because it hasn’t been properly used. D: What about expanding that tour outside of Los Angeles? E: The Guggenheim in New York. D: You worked on that, how was that experience? E: It was very good. I was a working draftsman. I’ve had better experiences because there were so many of us working on it and I only did a small amount of work on it. Other buildings that I’ve worked on more completely were the Walker residence in Carmel and the Tonkens residence in Cincinnati. Other great buildings I’d recommend seeing are the Japanese Palace in Kyoto (Name?). Then there’s the Portola in Llhasa where the Dalai Lama lives. D: How did the Wright Organic Resource Center come about? E: Well, some friends got together to form an organization to help me build my house. And I felt that was a wonderful gesture, but I said that if I was going to make an organization and spend that time, I’d really like to make a non-profit organization that promoted organic architecture and use the property for events. D: What kind of activities does the WORC sponsor? E: We sponsor workshops in sustainable architecture, sustainable materials. We’ve had workshops on Cobb architecture, on solar energy, the first hybrid cars. We’ve had bamboo workshops, all kinds of things. Usually, we can take 40-50 people and we always try to have half of them be students from South Central LA. There are kids from Locke, Belvedere and another high school that come up and be part of the workshop and sometimes stay overnight. For some of them it’s their first time to be out camping and they’re so amazed. We don’t have a lot of stars, but you can see more than you can in the city and they’re amazed at that. I remember one morning serving breakfast to them and one of the boys said, “God, it’s so quiet up here. I can’t get over it. No sirens, no gunshots.” I thought, my God, what an environment these kids are living in. They need a little taste of what it is to be out in nature, beyond the human nature. M: What’s going to happen now, is this Summer solstice, there’ll be 18 kids who have not had a nature experience and they’ll work together with Eve. They’ll come up, spend the night and be part of the solstice. Then we’ll arrange a come back and touch base, you know it’ll be ongoing. We haven’t had that in the past. D: Are you always looking for sponsors? E: Oh, yeah. The problem is that right now, Kevin and Hannah who are heading up the Wright Way—they’re my chief associates and work in the office, so it’s pretty hard running the whole thing. That’s why we’ve hooked up with this woman who’s very interested in doing these workshops for inner city kids. D: What advice would you give to new architectural students? E: Well, I think the best advice is to try and understand the principles of nature—what nature is…looking at nature, looking at how, when you see trees, they have the central stem that comes up and then they have the cantilevered limbs. They’re not just coming straight up out of the ground, they have a trunk and then they come out. So, there is this sense of hovering out over the ground. I always feel that’s an interesting thing for buildings. And you really want to be true to the nature of the materials that you’re going to be using. I think you need to have to have a certain background in structural solutions and how you do structural calculations. That’s extremely important and it’s not very well covered in the schools. I think one ought to study natural architecture, architecture done by native cultures throughout the world. D: Because they’re more in touch with nature? E: Yes, especially the Japanese, the Chinese and well, the native Americans. Can’t find a better structure than a teepee. Talk about a mobile trailer home. A beautiful, handsome structure, very simple. It’s in a circular form which is one of the best forms for people to sit and talk and be together and sit in a circle. I think also that students of architecture should do a lot of drawing and going out in nature and painting, cultivating the artist’s sense, the artist’s eye. It helps you with form and color. And if you combine that with structural engineering you’ve got an architect. But they don’t do that in schools. They don’t study art. It used to be that they taught you how to draw a building and how to draw perspective and do all that, but now you don’t even learn that. It’s all on the computer. You learn the computer. So everything is with the computer, you don’t know how to use a pencil. They come here and they can’t draw. E: I think what is lost is the sense of the eye coming from right into the hand and the pencil and what you’re drawing. You’ve lost something when you have to hold the mouse and click on and look on the screen. You’re not drawing that, you’re controlling it and it’s not the same. When I draw with a pencil I can change the weight of line and press and I can come quickly in and shape. You can’t do that with the computer. It’s a process that you have to stop and think, now I have to put in the shape thing and then I have to stretch this and this and this. It actually takes longer to make a rendering, a really good rendering. You can do a very quick mechanical rendering on the computer, but it’s rather stiff, cold, whereas when you draw by hand it’s more alive. They’ve lost that sense of feeling of artistic quality and it’s made them more mechanical. D: It’s sort of one step away from nature. E: And I think that’s why so much modern architecture now looks so mechanical. It looks like expanded factories. Or it’s rather cold, mechanistic looking, machine derived. D: What do you think of Gehry’s Disney Hall? E: Gehry’s Disney Hall is not organic architecture, although people say, well that’s a wonderful form and shape. Well that shape, the outer shape is not formed from the inner building. If you go into Disney Hall, it’s a box basically, rectilinear with rounded corners. And a very nice space—the seating is too tight—but it has somewhat of a good feeling. Wood is wonderful as an acoustic material. But that’s completely different from what’s outside. I see nothing of the inside space reflected in the outside form. So, really what Frank Gehry is doing is sculpture. He builds a box, a building inside which you work in, usually a box, and then he puts this piece of sculpture on top of it. And that’s not the way of organic architecture. D: Goethe called architecture frozen music. Accepting that for the moment, what music is emanating from your structures? E: Ah, well, I like to think probably Bach would be the closest. Because it has a geometric structure, at least that’s what I sense when I hear it. Of course Beethoven is marvelous. His later music is very abstract, but Bach would be a closer analogy. D: What are your plans for the future? E: To press on with the work I’m doing. We’re involved in a project making affordable housing in East LA. Also, we’re doing a mixed-use project in Altadena. I’m very interested that—the public and it’s relation to the commercial sphere and how we relate it and make it more human than it has become, especially here in LA. A pet thing that I’d love to do, would be to design an elementary school that would be completely integrated with the natural environment. So that the kids would be involved with the landscaping. The school would be part of the landscape, the landscape would be part of the school so that they would feel the sense of nature where they’re learning. They can have a garden and then they eat the things out of the garden so that they get the fresh natural food that they’ve grown, so they’ll appreciate it. They’re always much more willing to eat a salad if they’ve grown the lettuce, cucumbers and tomatoes. Then the idea, too, would be that I would love to have that based—kindergarten and the first two grades—based on the Froebel system. E: He’s a German philosopher who actually created kindergarten around 1840 in Germany. He devised this system for children learning to abstract from nature. Klee and Mondrian were both trained in the Froebel system. And my grandfather was trained in it. E: — in the school itself. And the children would help with taking care of the planting and the landscaping. D: So, just like your grandfather wanting to integrate the outside with the inside even going so far as to design furniture that goes with it, you’ve found that influence in your own thinking? E: Oh, yeah. The problem that we have with the furniture—which is not easy to design—chairs—a good chair is harder to design than a good building… The architect should be able to do the whole thing. Unfortunately, it’s very expensive so by the time the people get the building built they haven’t got enough money or energy left to get into furniture. D: They end up at Ikea. E: Right. Usually, I try, though I’m not always successful, to do the dining room furniture, at least the dining room table and chairs. My grandfather in the early days, labor was cheap and so upper middle class people could afford to have the whole house furnished. He would do the draperies. Once, he had two women clients who had him design their clothes for them to go with the house! D: Could you share with us a story or two about Frank Lloyd Wright? I remember another time, again working on the damn a couple of years later. It had a hole in it and there was a stake truck stuck in the mud of the damn. My grandfather was standing there, he always loved that, out working with the equipment. He liked watching over the construction projects. I was getting ready to go over and get the bulldozer. Brandock, who is also a grandson of his, had a couple of Percherons that he’d been raising— they’re big work horses. He had two beautiful big ones and he said, “I’ll pull it out with the Percherons” And I said, “Brandock, they won’t do it, they can’t do it. This is too heavy. We have to get the bull dozer.” “Well, I think I can do it.” And Grandfather says, “Eric, let Brandock get the horses.” And I said, “Wait a minute. Are we gonna waste all this time—” “Let Brandock get the horses,” insists Grandfather. So, Brandock went and harnessed them up, came over, hooked them up and tried to pull, you know, and couldn’t quite do it. I started to say something and Grandfather called me aside and said, “I wanted to do this to help Brandock, you know, give him confidence…and,” a flush of emotion rises up in Eric as he finishes his grandfather’s words, “…you don’t want to destroy that.” I understood then what he was about. He had the time. We had the time. Let him [Brandock] try his work for what he could do. People always think of my grandfather as being the egotist, the one who has to just do his thing and we’re all there to support it. There was that element. There had to be that element or he couldn’t have done what he did. And I think you find this with most great individuals. But there were a lot of sides to my grandfather. 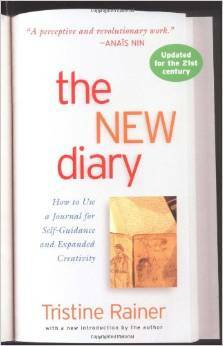 How to use a journal for self guidance and expanded creativity: Rainer’s The New Diary. This is a book that will inspire even the most seasoned writer. This classic which has sold over 200,000 copies, has been recently updated with a new preface.